The transition from school to work, including the core issue of youth labour market integration, is a key topic among current social research and policy interests. Its study in regard to different European countries is especially challenging, as they exhibit a wide range of institutional structures and macroeconomic context conditions. Further, data constraints, in particular a lack of adequate, accessible and comparative longitudinal data, have limited research in this area. This situation has improved with the introduction of the European Union Labour Force Survey (EU LFS) 2000 ad hoc module on transitions from school to work, which combines the strengths of the large-scale Labour Force Surveys with specific information on school-to-work transitions, like details concerning social background of respondents, their educational attainment and employment careers. Using this new database the collection of papers in this volume addresses central issues of youth transition research, including the effects of social background on educational and occupational careers (chapter 2 by Cristina Iannelli), the relationship between field of education and gender inequality in the labour market (chapter 3 by Emer Smyth), the incidence and consequences of job mismatches (chapter 4 by Maarten Wolbers), job search and mobility behaviour in the early work career (chapter 5 by Markus Gangl), and ethnic inequalities in the transition process (chapter 6 by Frank Kalter and Irena Kogan). 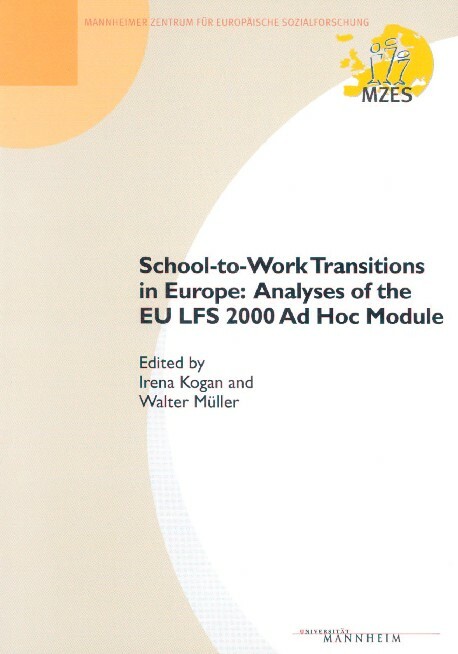 The first contribution in the current volume (by Irena Kogan and Frank Schubert) presents a descriptive overview of the general process of school-to-work transitions in Europe from a dynamic perspective utilizing the longitudinal information offered by the module to enhance the understanding of labour market integration processes in European societies. Markus Gangl is a senior research fellow in the Research Unit 'Labour market policy and employment' at the Wissenschaftszentrum Berlin für Sozialforschung. His main research interests are in the analysis of life courses and the dynamics of labour markets, in particular with respect to unemployment, income, and poverty dynamics. Cristina Iannelli is a research fellow in the Centre for Educational Sociology at the University of Edinburgh. Her main research interests include educational transitions and transitions from school to the labour market in comparative perspective, track differentiation in education and social inequalities in educational attainment, and occupational prospects of young people. Frank Kalter is a senior research fellow at the Mannheim Centre for European Social Research (MZES), University of Mannheim. His research interests include residential mobility, migration and ethnic relations, sociology of the family, rational choice theory, and methods. Irena Kogan is a researcher at the Mannheim Centre for European Social Research (MZES), University of Mannheim. Her main research interests include immigration and ethnicity, social stratification, and inequality in international comparison. Walter Müller is professor of sociology at the University of Mannheim and director of the Mannheim Centre for European Social Research (MZES). His main research interest lies in the comparative analysis of social structures of modern societies and his publications include several books and numerous articles on social stratification, labour market developments, and on the role of education for job allocation and for patterns of social mobility in industrial nations. Frank Schubert is a research assistant at the Mannheim Centre for European Social Research (MZES), University of Mannheim. His research interests include international comparisons of educational attainment and school-to-work transitions, as well as social networks within different life styles. Emer Smyth is a senior research officer with the Economic and Social Research Institute, Dublin. Her research interests centre on school-to-work transitions, gender and the labour market, and school organisation and process. Maarten Wolbers is a senior researcher at the Research Centre for Education and the Labour Market (ROA), Maastricht University. He is project manager of a large-scale annual survey among school-leavers from secondary education. His main research interests include social stratification and school-to-work transitions.